The past two off-season winters have been spent restoring the common area rooms. We lost a lot of sleep, breathed a lot of dust, hired a lot of contractors, spilled a little paint, scuffed a few knuckles and sometimes wondered if we had lost our minds. We have an ongoing argument over using the word "restoring." Marti prefers the term "remodeling" saying that if we were "restoring" her, we'd be using original building materials and techniques like real plaster and lathe instead of sheet-rock. David counters that there probably wasn't any indoor plumbing or electricity when the house was first built and he's not willing to restore the outhouse. So we simply agree to disagree and ask ourselves "What would the Victorians do today?" We do try to make "her majesty" look as though you've stepped back in time to 1870 knowing that a true purist, such as Marti, will notice some modern concessions. The period perfect Bradbury & Bradbury art papers really create a beautiful Victorian experience. Two custom manufactured mill-work knives allowed us to match the existing wood trim. 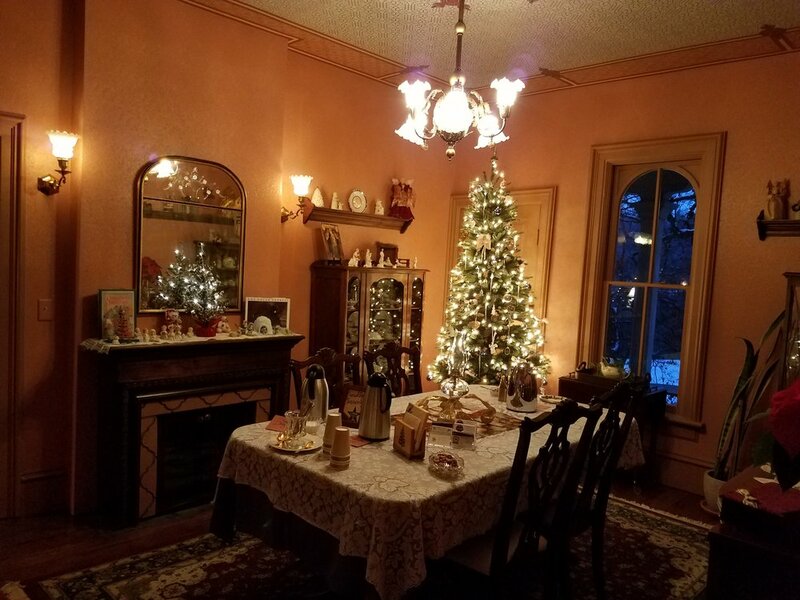 We've searched diligently for vintage fixtures and other "extras" to recreate the period from which this house was built. It has been a labor of love and will probably never be truly finished, but we think the outcome is fantastic and hope you agree! We turned an informal country style room into a formal beauty that still feels inviting. Our meals are served here and many a game has been played around the table by our guests. Over the years this room has seen bathrooms built in two different corners and served as first floor living quarters. We talked with the oldest prior owner who shared his earliest memories of what the old library looked like. We attempted to recreate the feel of the original to the best of his memory. You'll find dark woodwork, arched alcove, rich colors, and built in bookcases in this warm surrounding. Look closely and you might find the hidden TV! 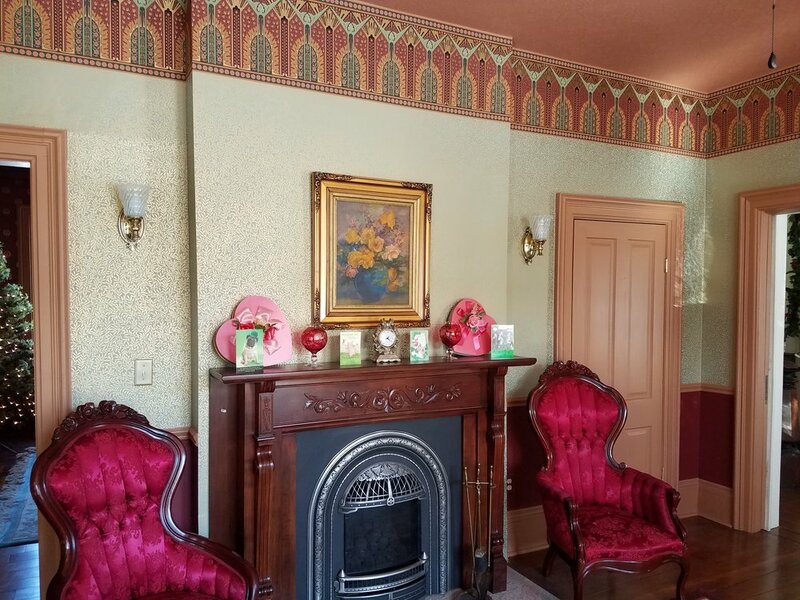 We replaced a dated brick fireplace with an arched Windsor style gas insert and a period appropriate antique mantle. We opened the wall between this room and the library to add a new water closet, complete with pull chain toilet. 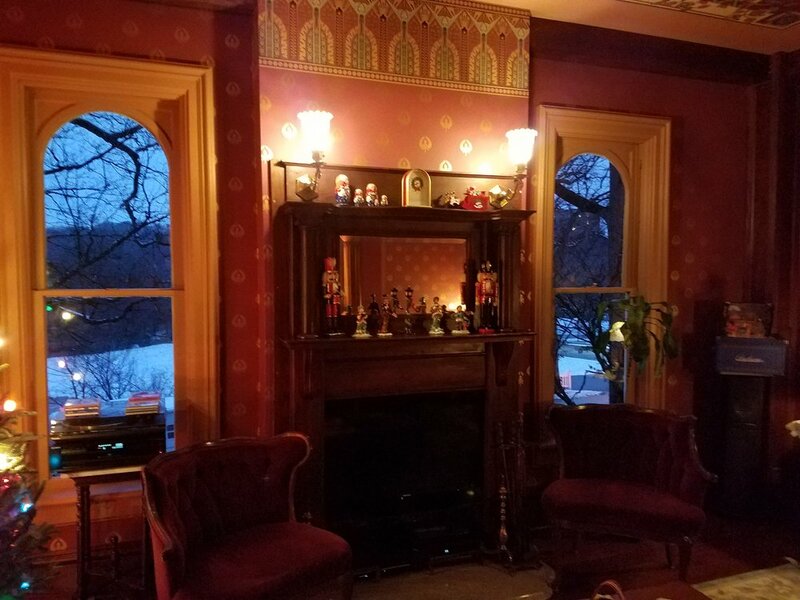 Antique wall sconces adorn the walls, and the room now features tripartite wall papers, Anaglypta ceiling, an arched bay window full of natural light, and of course the magnificent fireplace. Our latest big project didn't require the demolition hassle of the other rooms, but did require some serious scaffolding on the curved staircase. The Bradbury & Bradbury designs on all the walls and ceilings are amazing, causing this area to replace the dining room as the house's favorite by our wallpaper artist, Stacy Bolson.... and it's his second favorite of all the rooms he has ever done, anywhere. Carved out of space required by the old chimney and the arch in the library, this small water closet now features a high tank pull chain toilet. A welcome addition to the first floor amenities especially for guests who are not actually renting the rooms!